Even though the ideology of President Donald Trump’s administration has been to deny climate science, communities across the country and institutions around the world have continued to rely on the U.S. government to grapple with the climate crisis. Whether it’s dealing with the devastating impacts of global warming, or supporting research efforts to better understand it, the government shutdown has abruptly stymied that work. Update: Scientists despair as US government shutdown drags on. Space missions can continue to collect data, but thousands of federal researchers are forced to stay at home without pay. Thanks to Chris Jones for this citation. From Homeland Preparedness News: DHS Sci. and Tech Directorate Collaborating With FEMA on Puerto Rico Recovery Plan. This is a new approach to recovery plan preparation that I do not think has been used before. The U.S. Department of Homeland Security (DHS) Science and Technology Directorate (S&T) is assisting the Federal Emergency Management Agency (FEMA) in drafting a report assessing hurricane damage in Puerto Rico and outlining a plan to rebuild that is due to Congress by Aug. 8. DHS S&T has provided FEMA with access to the Homeland Security Operational Analysis Center (HSOAC), a federally funded research and development center (FFRDC), to help complete the report. Scott Randels, director of DHS S&T’s FFRDC Program Management Office, visited San Juan in February to begin collaboration on the report. “To ensure transparency and multiple opportunities for feedback, HSOAC is using agile management methods and plans to release multiple drafts building toward the final products,” Cynthia Cook, the HSOAC project lead for the Puerto Rico recovery plan, said. Trump Leaves Science Jobs Vacant, Troubling Critics. On the fourth floor of the Eisenhower Executive Office Building, the staff of the White House chief technology officer has been virtually deleted, down from 24 members before the election to, by Friday, only one. Scores of departures by scientists and Silicon Valley technology experts who advised Mr. Trump’s predecessor have all but wiped out the larger White House Office of Science and Technology Policy. There is a one-page of Highlights, and the full report is 185 pages long. NOTE: The Diva has not yet read through the full report. She welcomes comments from readers. Making America More Resilience toward Natural Disasters: A Call For Action, by Howard Kunreuther, Erwann Michel-Kerjan and Mark Pauly. From Environment Magazine, July/August 2013. The title does not really do justice to the wide array of useful content here, so I suggest you download the full article and decide for yourself how you would categorize it. Hurricane Sandy caused an estimated $65 billion in economic losses to residences, business owners, and infrastructure owners. It is the second most costly natural disaster in recent years in the United States, after Hurricane Katrina in 2005, but it is not an outlier; economic and insured losses from devastating natural catastrophes in the United States and worldwide are climbing. There is a wealth of useful information in this article, which makes it hard to summarize. It is thoughtful and clearly writtten. I consider this an essential document, one that I think will be a classic in time. Every week, the blog gets queries about FEMA – when is was created, why, and its functions. So I am bringing up an older posting that addresses those questions. If you are curious about when, why, and how FEMA was created, I recommend this well-researched, and objective account of the history of emergency management in the U.S. before and since the formation of FEMA: Emergency Management; the American Experience, 1900-2010 (second edition); 2012. Note that either a hard copy or the ebook version is available from the publisher and from Amazon. Disclosure: the Diva is the editor of this book. As the implementation planning for recovery begins, it is worth reviewing what the baseline is for national recovery guidance from FEMA. See the recent GAO testimony/report, titled Disaster Recovery; Selected Themes for Effective Long-Term Recovery; June 2012. A copy is attached here:Testimony-Czerwinski. It reviews the National Disaster Recovery Framework and the newly created position of Federal Disaster Recovery Coordinator. Also the National Preparedness Goal — npg — issued in Sept. 2011 by DHS, outlines the “core capabilities” needed for state and local governments to deal effectively with a catastrophic disaster event. The extent to which this document has contributed to capabilities for recovery in the states and municipalities affected by H. Sandy remains to be determined. The pending recovery from H. Sandy will allow us to watch the implementation of the NDRF, the role of the FDRC, and the new role created for HUD Secretary Donovan, who was named by the President as the overall manager of recovery for NY and NJ. The interaction among those 3 positions/persons will be most interesting, in my view. Who Is in Charge of What During Major Catastrophes Still Unanswered . National Defense Magazine, November 2011. When a natural or manmade disaster strikes the United States, which federal agency is in charge of the response? The answer is all of them and none of them, former Commandant of the Coast Guard retired Adm. Thad Allen suggested recently. Homeland Security Presidential Directive-5, released in 2003, said that the Department of Homeland Security secretary takes command of a non-defense related catastrophe. A presidential policy directive released in April this year reiterated this. “Tell that to [Health and Human Services] in a pandemic,” Allen said at the National Defense Industrial Association homeland security conference. 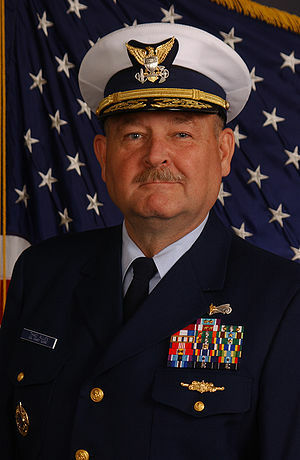 Since his retirement in 2010, Allen has emerged as a leading voice in the disaster response community.